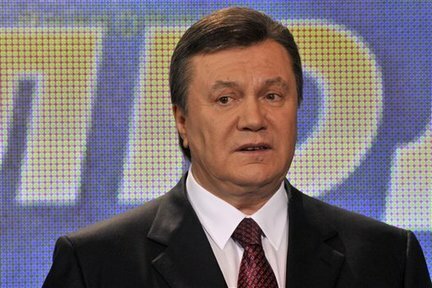 KIEV, Ukraine -- Ukrainian President Viktor Yanukovych and his government won valuable time to handle the fallout from unpopular reforms Friday when the parliament backed elections in October 2012 rather than early next year. In a first reading of proposed constitutional changes, the parliament voted heavily for extending its own mandate by one year and in favor of fall 2012 elections. The size of the vote — 305 out of 450 deputies — was more than the two-thirds required and an easy passage through a second, conclusive reading in February seems certain. It suggests that Yanukovych and his government will now avoid spring elections when his Party of the Regions would have risked finding itself on the receiving end of public anger over economic reforms. Thousands of small business owners — Ukraine's emerging middle class — took to the streets for several days last week to protest a new tax code, passed by parliament on Thursday, that they say will destroy their livelihoods. Apart from this, there is public resentment at the 50 percent hike in the price of household gas and great apprehension over a mooted pension reform that will raise the pension age for women to 60 from 55. "It gives the government space for maneuver for taking unpopular measures. If public support is dropping now, they may be able to recover at a later stage," said ING analyst Alexander Pecherytsyn.